Proving Toni Reavis to be right, the interest in this race is huge because the characters, at least one of them, is unbelievably well-known. 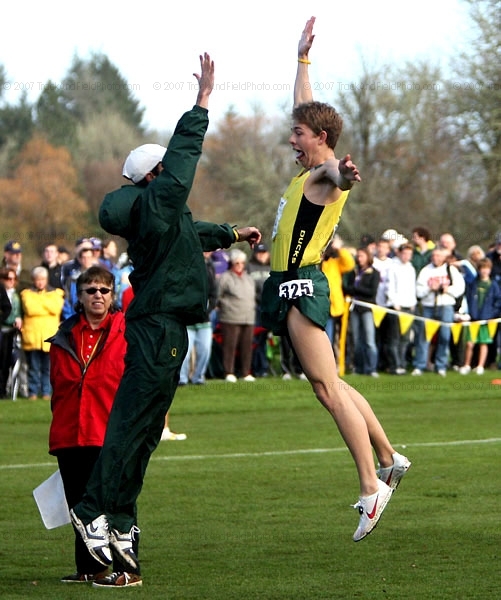 The well-known character is Oregon's Galen Rupp. Let there be no doubt about it. Galen Rupp is the New York Yankees of running; he's got every possible resource at his disposal and because of that he's either loved or hated. The Golden Boy has his own private coach, altitude tent, underwater treadmill, anti-gravity treadmill and even training partners. And he's basically had those things since high school. For a long time (and maybe still currently), he didn't even live in the same town as his teammates as he trained in Portland with private coach Alberto Salazar while the rest of the Oregon Ducks trained in Eugene, Oregon with Vin Lananna. We agree 100%. While Rupp certainly has every thing that's borderline legal at his disposal, one should not forget that he is an immense talent (at age 18, he broke Gerry Lindgren's 40-year-old 5k HS record by running 13:37.91) with a huge drive, and we'll add in another thing - he's a hell of a competitor. Rupp's rival, Liberty's Sam Chelanga, literally comes from the opposite side of world both literally and figuratively. A few years ago, he was living in Kenya with few prospects. He failed to get one of the few scholarships to college in Kenya, so his days were spent running errands. He wasn't even a runner - ping pong was his sport of choice. But, like Rupp, he did have a mentor who was a great runner himself. Sam's older brother, Joshua, who has since won the Rotterdam and Seoul Marathons in 2007, told him he should try running so he could go to school in the US. Sam took to running and the rest is history. Unlike Rupp, however, Chelanga is the ultimate self-made success story. He certainly wasn't living in an altitude tent when he was competing as a complete neophyte at Fairleigh Dickinson in 2006. However, talent and drive go a long way, as Sam was soon totally dominating the competition. In his first race at famed Van Cortlandt Park, Chelanga was way ahead of the the field and so alone in the back hills that he was certain he'd taken a wrong turn and was lost. As a result, he turned around and tried to rejoin the course by re-tracing his steps only to see the rest of the field coming right at him. After sitting out 2007 as a transfer (he ran 13:24 last year unattached), Chelanga has gotten used to being clear of the field. This year on October 3rd, he ran 23:05 to break the course record at Paul Short and win by 38 seconds. On October 18th at Pre-Nats, on a day when the course was running 18-20 seconds per place slower than last year, Chelanga put on a breathtaking performance as shattered Josh McDougal's 22:56 course record by running 22:51 to win by some 44 seconds. Indiana State coach John McNichol described Chelanga's Pre-Nats run perfectly when he said that it looked like a "high school senior running against a junior high team." Recently, it's been the Golden Boy himself, Galen Rupp, that has been looking like a man amongst boys as he's come up with two straight unreal performances. Rupp won PAC 10s by almost 37 seconds before winning the West Regional by a ridiuclous 51 seconds. So Chelanga from early to mid-October and Rupp from late October to now have put up some insane performances. The question is, "Who has the edge?" Undoubtedly, Chelanga would have been the NCAA champion in early October. However, NCAA titles aren't won in October, they are won in late November and that's what concerns us. Did Chelanga burn it too hot too early? Or was he just trying to test himself (since he hadn't really raced XC since 2006), back off a little and then come up with an even bigger peak? We'll find out on race day as it's impossible to know for sure. If you are a Rupp fan, you'll tell yourself that Chelanga is still in many ways a running neophyte and he certainly isn't working with a coach that has worked with him for years and thus it's conceivable to imagine he burned it too hot, too early - just as Josh McDougal did at Liberty in 2006. But if you believe in Chelanga, you'll remind yourself that McDougal was killing it early and late last year and so there is no reason to think it can't be done by the more talented Chelanga. Rupp fans can certainly be confident in the fact that he is clearly at another level than he was last year when he was the runner-up. Coming into last year, Rupp was a 27:33 guy in ideal Stanford conditions. This year, Rupp ran 27:36 in the heat and smog of the Beijing Olympics. Undoubtedly in August, given that performance, Rupp was in (or at least close to) American Record shape (27:13.98). We imagine he's in very similar shape now. Normally that would guarantee one a victory at NCAAs, but not this year as one will need to be in low 27-minute shape to beat Chelanga if he's on top of his game. Rupp haters will point out that despite his amazing accomplishments, Rupp has never yet won the big one. The runner-up at Foot Locker in HS, he's never yet captured an NCAA title. Will he be the greatest runner in history to never win an NCAA title? The stats indicate that if both runners are on their game, it very well could be a race for the ages. At Pre-NCAAs, Chelanga beat Stanford's Garrett Heath and Chris Derrick by b 45.1 seconds and 45.7 respectively. At PAC 10s, Rupp beat Derrick by 43.0 and Heath by 46.0. Certainly within the statistical margin of error. We'd be shocked if neither Rupp nor Chelanga wins, but if neither of these two gets the job done, the winner might be Shadrack Songok. The former Texas A&M Corpus Christi product is now a grad student at the main Texas A&M campus. A 3-time NCAA champion in track, including the last two NCAA 10k titles, Songok in any other year would be considered to be right in the mix. It shouldn't be forgotten that in 2006, Songok beat Rupp in the 10,000m on the track at NCAAs. 7th last year, he is the 2nd-highest returner from last year (Rupp obviously is the #1 returner). Songok, however has been beaten twice this year, and if you are good enough to beat Songok, theoretically you are good enough to win it (at least in a normal year). So don't discout Lamar's Samuel Kosgei, who won at Notre Dame, and Oklahoma State's freshman phenom German Fernandez, who beat Songok at Big 12s. The mention of Fernandez is a good segue into the team title talk. Like the men's individual race, we expect it to be a mano-a-mano affair between #1 Oregon and #2 Oklahoma State. Oregon comes in as the favorite on paper. They didn't graduate anyone from last year's championship team, plus they have added in super-frosh Luke Puskedra. They'll probably also add in 800m Olympian Andrew Wheating. Normally, you'd think that would be enough to win, as the biggest problem coach Lananna has is picking his top seven guys to run. He's got at least 9 guys who could theoretically finish in the top 50 in the team scoring if they ran well. He's got 5 back from the top 30 in the team scoring from last year in Rupp (1st), Shadrack Kiptoo-Biwott (6th), Diego Mercado (21st), Kenny Klotz (27th) and Daniel Mercado (28th). Add in Wheating and Puskedra and you are out of room with no space for the 11th and 12th placers from PAC 10s in Matt Centrowitz and Curtis Suver, who both beat Klotz and Danny Mercado at conference (Diego didn't run PAC 10s). How does Lananna choose? We don't know, but we do know he did a masterful job of it last year. Despite Oregon's amazing depth, they are by no means almost certain winners like the Washington women, as last year's 3rd-place team, Oklahoma State, returns two from the top 25 in the team scoring last year in Ryan Vail (11th) and and David Chirchir (21st) and four from the top 50 in Daniel Watts (42nd) and Matt Barnes-Smith (48th). Plus the Cowboys have added in three real studly newcomers, led arguably by the greatest American-born freshman since Bob Kennedy in German Fernandez, who - if it weren't for Rupp and Chelanga - might just pull a Kennedy and win the whole thing as a true freshman. Their other new additions are freshman Colby Lowe and junior transfer John Kosgei from LSU. Kosgei is the man who took the SEC by storm last year when he won the mile in 3:59 and 3k in 7:55, whereas Lowe is an exceptionally good freshman. Speaking of really good freshmen, there is one other freshman phenom in Stanford's Chris Derrick. With Derrick, Puskedra, Fernandez and Lowe, we very well may have the greatest American-born true freshman quartet in history. Of the five, Lowe who was 5th in the Big 12s, is the one who has done the least this year. Unbelievable. Last year, Minnesota's Hassan Mead was the top American-born freshman in 43rd overall. This year, there very well could be four higher than that. But on to our predictions. Who do we got? In the team battle, let's break it down ... In the chart below, we list each team's runner by projected position and then give their projected finish. 1. Galen Rupp (2nd) 1. German Fernandez (5th) Edge: Oregon. Rupp by a few spots. 2. Shadrack Kiptoo-Biwott (4th) 2. John Kosgei (13th) Edge: Oregon. Kiptoo-Biwott was 9th last year. Hard to beat that, but Kosgei isn't too far behind. 3. Luke Puskedra (21st) 3. Ryan Vail (19th) Edge: Ok. State. An extremely slight edge to Vail, who was 11th last year and is more experienced. Edge: Ok. State (individually)*. Oregon (team) We give the individual edge to Chirchir, who was 21st last year, whereas Diego Mercado was 30th and Klotz 37th. The bad news is Chirchir was only 13th at Big 12s before running with the OSU pack at Regionals, so we're only picking him in the 30s this year. Edge: Ok. State (individually)*. Oregon (team). *If you were betting Lowe versus the Oregon 5-7 combined, bettors would say to take Oregon. 6/7. Matt Barnes-Smith/ Daniel Watts Edge: Oregon. Overall: Edge: While the individual edge goes to Oklahoma State 3-2 thanks to their edge at 3-4-5, Oregon's theoretically superior up-front power as well as overall depth make them the favorites. But ... Oregon has little room for error. If Chirchir and Lowe each run as we've picked them the tables could turn. Analysis: While as fans of the sport, we love seeing a non-traditional power in upstart Oklahoma State have a chance, the facts point to Oregon being the favorite, but this could be a very, very close race. If the teams were only allowed to run five runners, Oklahoma State would win. If they were scoring 9, no doubt Oregon would win. But the fact of the matter is you run 7 and score five, and as a result, we figure the slight theoretical edge goes to Oregon thanks to their superior depth. On paper, Oregon is a little stronger up front that Oklahoma State, but a few points difference in the top 2 or 3 runners might not matter as much as what happens at numbers 4 and 5. Oregon's superior depth seems to give them the advantage there, but it's clear that if Oklahoma State can have their top five run A races, they could pull the upset just as Oregon did last year as individually. Looking at the top five, the slight edge may belong to Oklahoma State. Oregon is the favorite but no one will remember us if we pick them. Our analysis says Okla. State can win and thus we're going out on a limb and picking them for the upset. NCAAs hasn't treated the #1 team well in recent years. Like the team race, the individual race is really too close to call. Honestly, Oregon could easily get victories in both or defeat in both, but they are probably most likely to get one of each. But again, we are known for going out on a limb and did so in mid-October by guaranteeing a Chelanga victory and thus we are going to stick with our pick and sweat it out. But if we are wrong, we'll be the first to congratulate Rupp and the Ducks for individual and/or team titles. After Rupp and Chelanga, it's very hard this year as the field is very, very deep. We give you our top 40 individuals below but please realize that any of the guys in the second half of this list could get in the top 20 and we know we've left off quite a few others that could as well. But if we put, say, Matt Withrow or Garrett Heath or Emmanuel Bor or Francis Kasagule in there, who in blazes do we take out??? So many studs! Great Offer: Nike Lunar Glide Sale Multiple colors of this shoe available.